Sometimes, I just need to unwind with LEGO and Blender fun. Trying to keep with my promise, here are my latest LEGO renders. Each is an experiment. I�m trying different techniques, or testing new ideas. Some work, and some don�t. But, that�s okay. Life is about learning and trying. Why shouldn�t my hobbies be the same? Let�s dig in. A little Disney goes a long way. 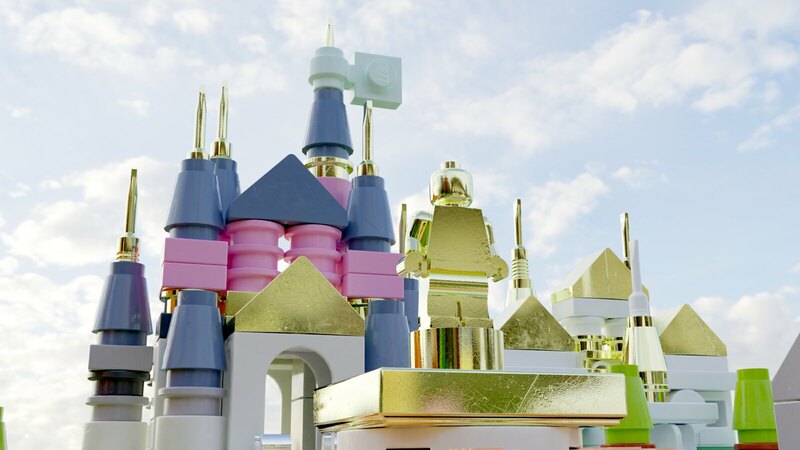 Taking a look at what was new on Mecabricks, I ran across a number of renders of for Disneyland Microscale - Lego Project by Carlierti. 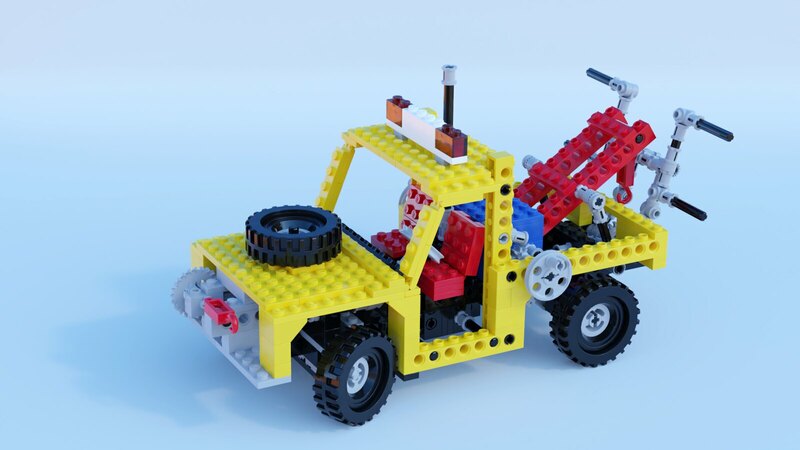 Created for his now expired LEGO Ideas Project, it garnered a fair amount of interest and some additional renders by Samino. I encourage you to check them out as Samino is still learning, but was able to create some nice images using Scrubs� Blender scripts. The model itself is quite nice. It does a good job of replicating each area of Disneyland in micro-scale. His project site shows each area as a separate build, but his Mecabricks project puts them all together in a nice package. I immediately wanted to give it a try myself. Since there were already two renders of the complete set, I decided to take a more personal view. I moved the camera low into the scene, capturing the statue at the center along with the iconic Disney castle. The angle took a bit to get right as I was trying to get both in frame. Plus, I need to be careful not to stretch their proportions. This was my experiment for this render. Since I was using Scrub�s advance add-on, the textures were a bit harsh this close up. I had to dial then down a bit so they weren�t so unrealistic. The fingerprints were also bit heavy this close up. To complete the scene, I grabbed a background from HDRI Haven, and rendered it with the sky turned on. The final image came out as I envisioned it. Happy place! A new kind of adventure. When I finished 4637, as noted last time, I still needed to finish the shirts on the minifigs. Monday, while watching the latest football game, I decided to grab some reference images to sketch them. Although I�d done this before, I underestimated the effort this time. So, here�s a little history on how I do this. I start by importing the reference images and UV maps into Boxy SVG. It is a native MacOS application, so it works well and fits my workflow. There are plenty of better apps, but this one works for me. Once imported, you have to overlay the image behind the UV map, then trace each line. Easy, right? Not so fast. This is real pain, especially when there are colors and gradients in the printing. Both of these shirts were detailed and complex. Nothing was easy about them. After a few attempts, I finally got things right. Or, at least good enough for the render. I�m pretty hard on myself, so all I see are the flaws. It didn�t help that I kept finding things I missed. But, they were done. Time to hide the reference images and export the final PNG. But, then I kept running into issues using the maps. Cheating, I swapped out other shirts into my model. I then exported and reimported it into my Blender scene. What a pain. Then, I found I�d messed up the positioning of the female. More fiddling and I was done. The final render used a brighter HDRI. Probably too bright, but I�m nit picking. My set was complete. Second experiment complete. I still remember picking up this last set at the toy store at the Navy Base in Naples, Italy. It was one of my first Technic sets, and I�m sure I still have most of the parts�even if they are buried amongst the rest of my sets. Nostalgia ran through me as I thought about rendering this set after so many years. 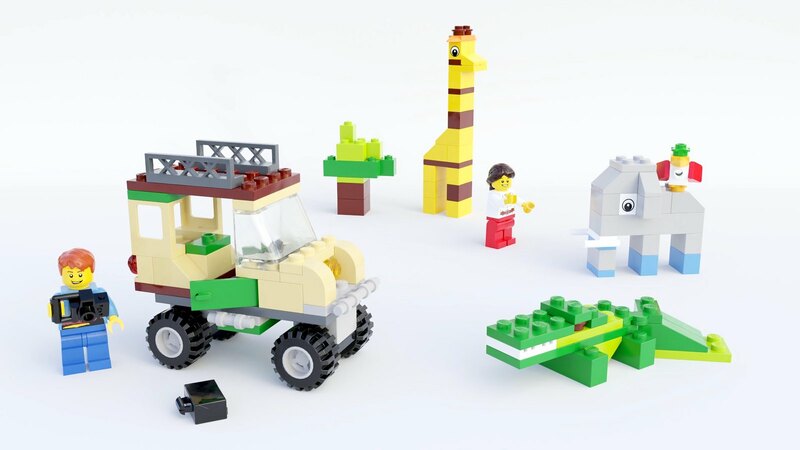 I�d seen this set before on Mecabricks, even commenting on it. So, I grabbed 307loewe�s model and got to work. First, I tweaked the tires based on my Crane render. I wanted to get rid of the gaps created by the work around for actual tires not being in Mecabricks� parts. To make the scene a little more interesting, I adjusted the wheels to turned position, then exported. To my dismay, the model was floating when I imported it into Blender. I did some positioning magic to get all the wheels on the ground. The back ones are actually a bit higher due to the springs in them. Not something you�d notice playing with the model, but it was a challenge replicating it in Blender. The real test was in getting the sky right. Experimenting with different skies, I ended up render the image a number of times until I got it right. I used to do the same in POV-Ray, but there it was required as there is no preview. Although there is in Blender, it is small, causing me to miss some fine details. Good thing Blender is way faster. After a few attempts, I had my final render. And there you have it. Three new images for December. Although fairly straight forward, the act of building and render these LEGO bricks is quite cathartic. I�m sure you�ll see a few more soon.